Anti-tumor-necrosis-factor-α (TNF-α) monoclonal antibody was used to treat Tg197 transgenic mice, which constitutively produce human TNF-α (hTNF-α) and develop a progressive polyarthritic disease. Treatment of both young (7- or 8-week-old) and aged (27- or 28-week-old) mice commenced when at least two limbs showed signs of moderate to severe arthritis. The therapeutic efficacy of anti-TNF-α antibody was assessed using various pathological indicators of disease progression. The clinical severity of arthritis in Tg197 mice was significantly reduced after anti-TNF-α treatment in comparison with saline-treated mice and in comparison with baseline assessments in both young and aged mice. The treatment with anti-TNF-α prevented loss of body weight. Inflammatory pathways as reflected by elevated circulating hTNF-α and local expression of various proinflammatory mediators were all diminished by anti-TNF-α treatment, confirming a critical role of hTNF-α in this model of progressive polyarthritis. More importantly, the amelioration of the disease was associated with reversal of existing structural damage, including synovitis and periosteal bone erosions evident on histology. Repair of cartilage was age dependent: reversal of cartilage degradation after anti-TNF-α treatment was observed in young mice but not in aged mice. Rheumatoid arthritis (RA) is a significant, chronic disease that afflicts 1% of the general population in most countries . Joint damage typically occurs before patients are diagnosed, and most of the joint destruction occurs within the first 2 years of diagnosis . Therapeutic drugs such as sulfasalazine and methotrexate (MTX) only slow the progression of the disease, suggesting that these drugs fail to adequately quell the underlying pathophysiology of RA . Tumor necrosis factor alpha (TNF-α) is elevated in sera and synovial fluid of patients with RA, suggesting that it may play a role in the pathology of the disease . Soluble TNF-α receptor or neutralizing antibodies against TNF-α have been shown to prevent collagen-induced arthritis in mice [5, 6]. Furthermore, a human TNF-α (hTNF-α) transgenic mouse (Tg197) develops a chronic, progressive polyarthritis with histologic features in common with RA . Weight loss and joint swelling in these mice are correlated with expression of hTNF-α mRNA in the joints  and hTNF-α concentrations in the serum [8, 9]. Previously, Keffer et al. showed that progression of disease in these mice could be prevented by treatment with anti-TNF-α monoclonal antibody (mAb). In this study, we utilized the Tg197 mouse model to further assess whether anti-TNF-α treatment can ameliorate established disease in both young and aged mice. Heterozygous Tg197 transgenic mice, obtained from Dr George Kollias (Hellenic Pasteur Institute, Athens, Greece) , were identified by PCR analysis using primers to the 3'-modified hTNF-α gene. Two experimental groups of 25 mice were used. 'Young mice' were enrolled into the study when they developed clinical signs of arthritis at 7 or 8 weeks of age. A second group of mice was maintained disease-free with 10 mg/kg of anti-TNF-α mAb weekly starting at 4 weeks of age; when they reached 24 weeks of age, the treatment was stopped and these 'aged mice' were allowed to develop arthritis before they were enrolled into the study. The enrollment criteria for both young and aged mice required them to have a clinical score of at least 2 on two limbs. The experimental protocols were approved by Centocor's Institutional Animal Care and Use Committee. The murine anti-TNF-α mAb used in this study binds with high affinity to hTNF-α and prevents binding to the TNF receptor . Anti-TNF-α mAb was administered by intraperitoneal injection at 10 mg/kg weekly and the animals in the control group received weekly injections of saline. Clinical scores were based on a previously described scoring system  modified as follows: 0 (normal), 1 (edema or distortion of paw or ankle joints), 2 (distortion of paw and ankle joints), or 3 (ankylosis of wrist or ankle joints). The sum of all four paws was scored weekly, with a maximum possible score of 12 per mouse. Specimens were processed and scored as described previously [12, 13] and in the supplementary material. Serum samples were separated from whole blood, which was collected by intracardiac puncture at baseline and at 3, 6, and 16 weeks post-treatment. Serum levels of hTNF-α were determined by ELISA at a 1:2 dilution according to the manufacturer's instructions (Biosource International, Camarillo, CA, USA). Samples were prepared as described in the Supplementary material and analyzed in an RNase protection assay according to the manufacturer's instructions (PharMingen, San Diego, CA, USA). All data are expressed as means ± standard deviation unless noted otherwise. Statistical significance was tested using analysis of variance for multiple groups. If significant differences were found, pair-wise testing was performed using Tukey's test. The level of significance for all comparisons was set at P < 0.05. Increased cartilage turnover and repair in response to insult has been observed in young mice, whereas aged mice show decreased cartilage turnover after closure of the growth plate . Therefore, anti-TNF-α treatment was evaluated in both young (7–8-week-old) and aged (27–28-week-old) Tg197 mice with established arthritis. The mean clinical arthritis score at baseline was 6 (Fig. 1), indicating arthritis was established at the commencement of treatment. The clinical arthritis score increased progressively in the saline-treated group and these mice were humanely killed at 6 weeks. 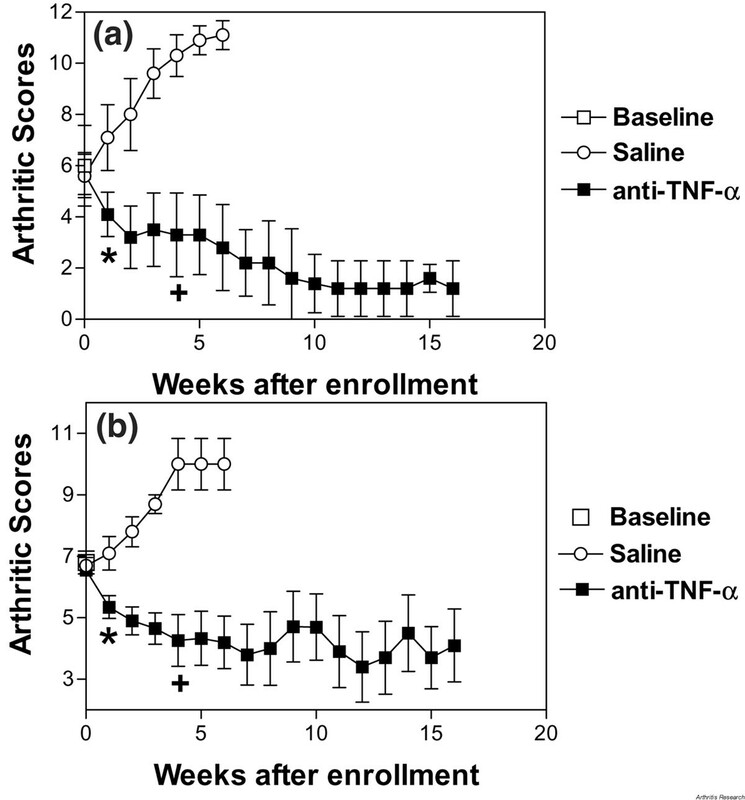 In contrast, the clinical arthritic score was markedly decreased in the groups, both young and aged, treated with anti-TNF-α, indicating a marked suppression of their arthritic symptoms (Fig. 1a,1b). Mice in the saline-treated group progressively lost weight, whereas mice in the anti-TNF-α group showed a significant weight gain throughout the study (see Supplementary Fig. 1). The arthritic score (weeks 1 to 16 post-treatment; Fig. 1a,1b) and weight gain (weeks 5 to 16 post-treatment; Supplementary Fig. 1) in the group treated with anti-TNF-α were significantly improved in comparison with the saline-treated group in both young and aged mice. More importantly, the arthritic scores for the group treated with anti-TNF-α were significantly improved in comparison with the baseline score from weeks 4 through 16 in both young and aged mice (Fig. 1a,1b). These results indicate that disease progression was not just prevented but was reversed following anti-TNF-α treatment. Treatment with anti-TNF-α monoclonal antibodies reverses established arthritis in Tg197 mice. (a) Young mice (at 7 to 8 weeks of age) or (b) aged mice (at 27 to 28 weeks of age) with established arthritis were randomized to three groups to be humanely killed immediately (baseline, open square, n = 5) or to receive weekly doses of saline (open circle, n = 10) or 10 mg/kg of anti-TNF-α (closed square, n = 10 through 6 weeks of age and n = 5 from 7 to 16 weeks). The mice were monitored weekly for arthritic score. *P < 0.05, versus saline-treated controls; +P < 0.05, versus baseline score; both scores remaining significant until the end of the study. Data are from two experiments. TNF, tumor necrosis factor. All joints were scored in a blinded fashion for synovitis, bone erosions, and cartilage degradation using a predefined scoring system. The mean histologic scores for each treatment group at various time points are shown in Fig. 2. Saline treatment was followed by increased histologic scores for synovitis, bone erosions, and cartilage damage relative to that observed at baseline. Anti-TNF-α treatment for 6 weeks significantly reduced all three histologic scores relative to the baseline score in young mice (Fig. 2) and two of the three histologic scores in aged mice (Supplementary Fig. 2). After 16 weeks of anti-TNF-α treatment, synovial inflammation and bone erosions were almost completely resolved in both young and aged mice, and a significant reduction in cartilage degradation in comparison with baseline was maintained in young mice. Cartilage degradation in aged mice treated with anti-TNF-α was similar to that at the baseline measurement and significantly lower than that in the saline treatment group (Supplementary Fig. 2). 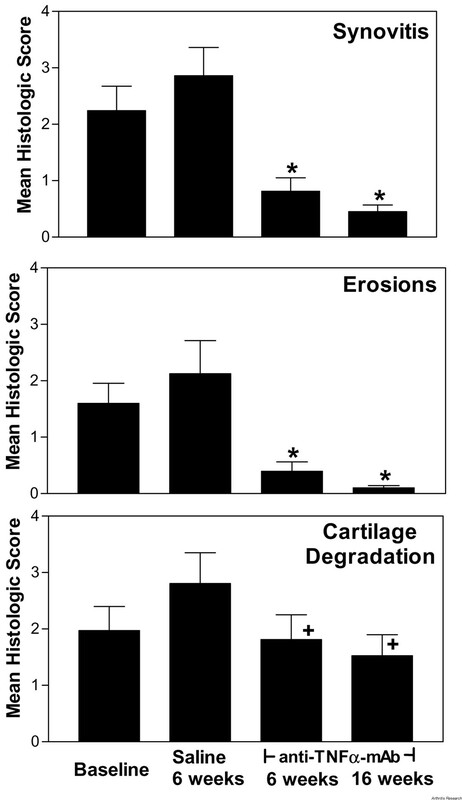 Synovitis, bone erosion, and cartilage degradation histology scores in young Tg197 mice. Joint tissues were harvested at baseline (n = 5) and after 6 weeks of saline treatment (n = 10) or 6 weeks (n = 5) or 16 weeks (n = 5) of treatment with anti-TNF-α monoclonal antibodies. All paws were subjected to blinded histologic analysis. *P < 0.05, versus baseline. mAb, monoclonal antibody; TNF, tumor necrosis factor. Representative tissue sections of the ankle joints from young mice are shown in Fig. 3. Evidence of arthritic disease was readily observed at baseline (Fig. 3a,3b), and the disease continued to progress in saline-treated mice at 6 weeks, with increased cell proliferation and inflammatory cell infiltration, erosion of cartilage and bone, and loss of proteoglycan from the cartilage (Fig. 3c,3d). However, after 6 weeks of anti-TNF-α treatment, improvements in all histopathological parameters were observed with both staining procedures (Fig. 3e,3f). No visible evidence of bone or cartilage erosion was observed and all signs of cellular proliferation and infiltration disappeared. The proteoglycan content of the cartilage was notably improved. Extended treatment with anti-TNF-α (for 16 weeks) maintained normal joint architecture (data not shown). These results demonstrate that blocking hTNF-α reverses joint inflammation and promotes joint healing in this model of polyarthritis. Histology shows significant healing of arthritic joints in young Tg197 mice after treatment with anti-TNF-α mAb. Tissue sections of the ankle joints were obtained from young Tg197 mice with established arthritis at baseline (a,b) and after 6 weeks of treatment with saline (c,d) or anti-TNF-α (e,f). Sections were stained with hematoxylin and eosin (a, c, e) or toluidine blue (b, d, f). The arrows in panels (a) and (b) indicate areas of cell infiltration (1), erosions (2) and loss of proteoglycan from cartilage (3). Original magnification, 20×. mAb, monoclonal antibody; TNF, tumor necrosis factor. To define the underlying mechanisms by which anti-TNF-α mAb ameliorated joint inflammation and structural damage, the levels of various proinflammatory mediators were examined. First, circulating hTNF-α levels as detected by ELISA were more than halved as early as 3 weeks and the reduction was sustained for 16 weeks after treatment with anti-TNF-α mAb in comparison with saline-treated animals (Fig. 4a). In addition, murine IL-6, IL-1β, and IFN-γ mRNA, which are expressed in the arthritic joint tissues, were clearly diminished following anti-TNF-α treatment when total joint RNA was examined by RNase protection assays (see Supplementary Fig. 3). 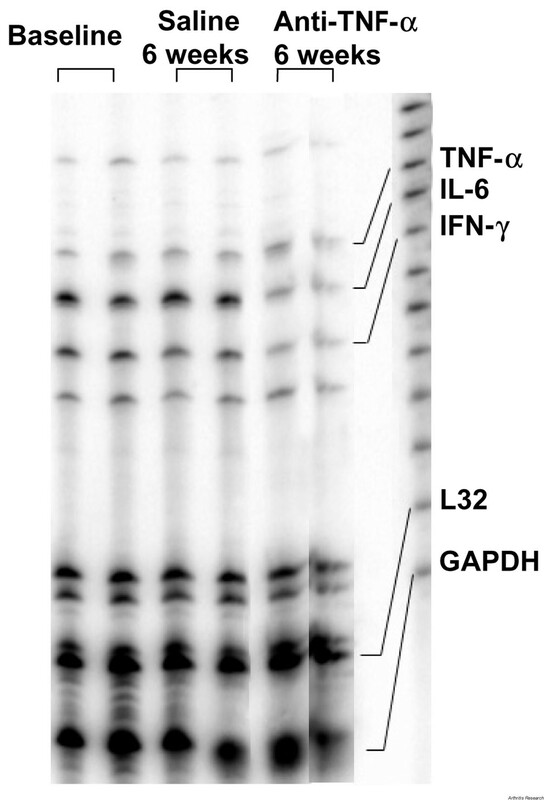 When the levels of murine IL-6, IL-1β, and IFN-γ mRNA were standardized to glyceraldehyde-3-phosphate dehydrogenase (GAPDH) (Fig. 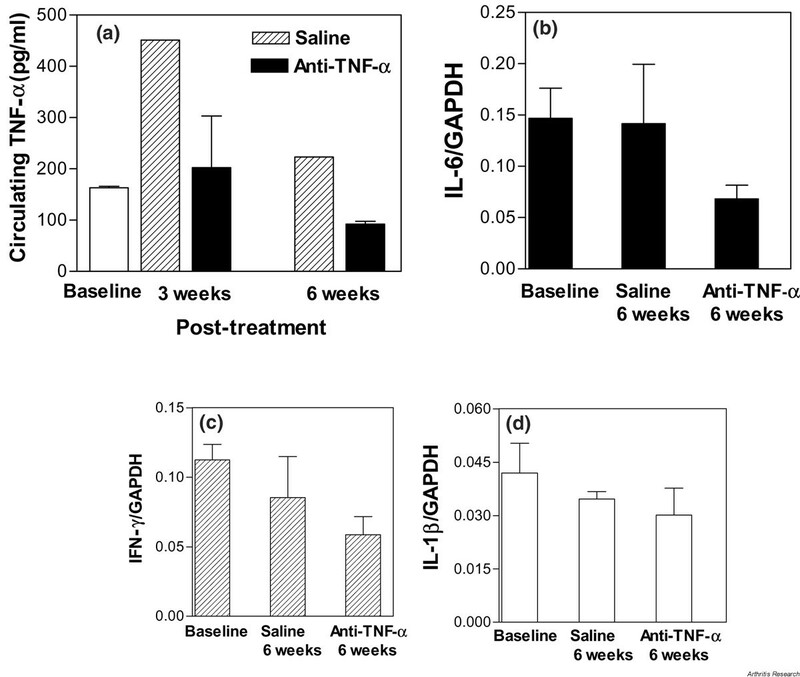 4b,4c,4d), a 2–3-fold reduction in murine IL-6 and IFN-γ was observed in the aged animals treated with anti-TNF-α in comparison with those treated with saline at 6 weeks post-treatment (Fig. 4b,4c). Interestingly, local expression of murine TNF-α mRNA was not affected by treatment with anti-TNF-α antibodies, suggesting that hTNF-α plays a crucial role in the pathogenesis of arthritis in this model. Treatment with anti-TNF-α monoclonal antibodies inhibits proinflammatory cytokine production in Tg197 mice. (a) Sera were collected from young animals at the indicated times. Levels of hTNF-α were determined by ELISA and expressed as mean ± SEM of each group. (b-d) Detection of proinflammatory cytokines, murine IL-6, IFN-γ, and IL-1β mRNA in joint tissue of aged mice. RNA was extracted from the joint tissues of the mice at baseline and 6 weeks after treatment with either saline or anti-TNF-α mAb. An RNase protection assay was then performed. The ratios of individual cytokine mRNA to GAPDH in animals treated with anti-TNF-α mAb are compared with those in saline-treated animals or animals at baseline. GAPDH, glyceraldehyde-3-phosphate dehydrogenase; mAb, monoclonal antibody; TNF, tumor necrosis factor. 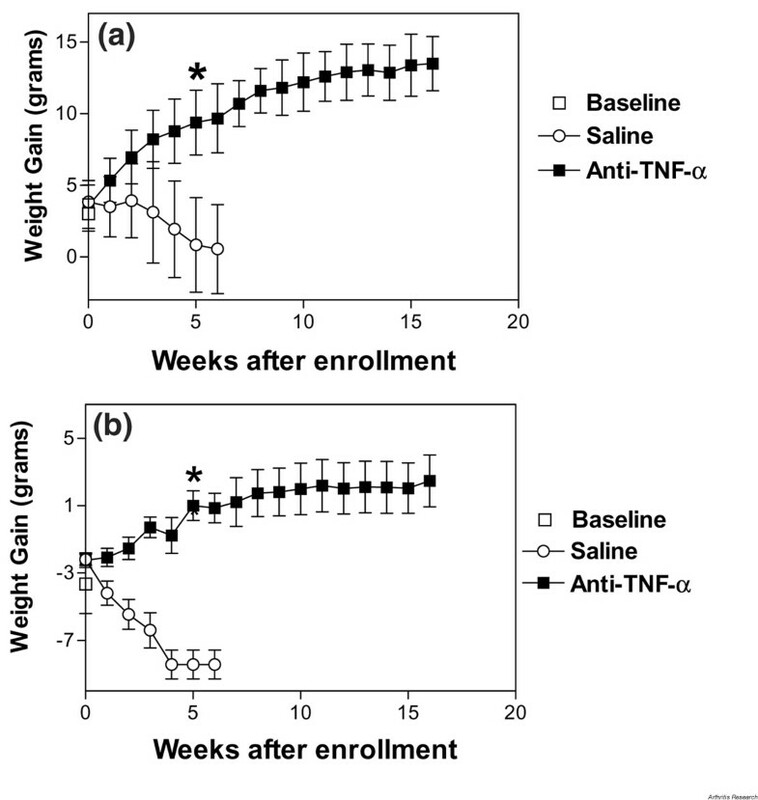 Anti-TNF-α treatment reverses weight loss in arthritic animals. (a) Young (at 7 to 8 weeks of age) or (b) aged mice (at 27 to 28 weeks of age) with established arthritis (arthritic score of 2 in at least two limbs) were randomized to three groups to be humanely killed immediately (baseline, n = 5) or to receive weekly doses of saline (open circle, n = 10) or 10 mg/kg of anti-TNF-α (closed square, n = 10 through 6 weeks and n = 5 from 7 to 16 weeks). Weight gain was measured as change from pretreatment weight. *P < 0.05, versus saline controls, and remained significant until the end of the study. TNF, tumor necrosis factor. 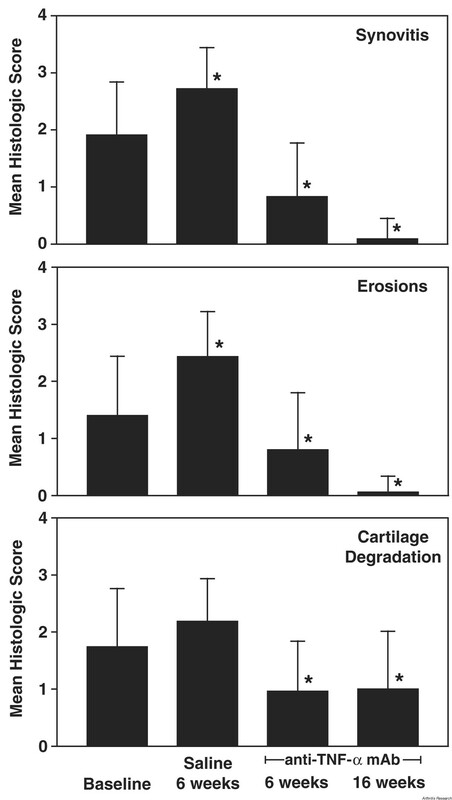 Histology scores for synovitis, bone erosion, and cartilage degradation in aged mice. Joint tissues were harvested at baseline (n = 5), after 6 weeks of saline treatment (n = 10), or after 6 weeks (n = 5) or 16 weeks (n = 5) of anti-TNF-α treatment. All paws were subjected to blinded histologic analysis. *P < 0.05, versus baseline; +P < 0.05, versus saline-treated controls. mAb, monoclonal antibody; TNF, tumor necrosis factor. Detection of mRNA of proinflammatory cytokines murine TNF-α, IL-6, and IFN-γ in joint tissue of aged mice. RNA was extracted from the paw joints at baseline and after 6 weeks of treatment with saline or anti-TNF-α. An RNase protection assay was then performed. GAPDH, glyceraldehyde-3-phosphate dehydrogenase; L32, ribosomal protein; TNF, tumor necrosis factor. Currently, MTX is the most widely used disease-modifying antirheumatic drug for the treatment of RA. However, MTX treatment rarely results in complete disease remission  and only slows the progression of joint erosion . In addition, long-term treatment with MTX is associated with pulmonary  and liver toxicities  and other side effects. Therefore, a treatment option that facilitates reversal of joint damage and has longer effectiveness and fewer side effects is desirable. Experimental arthritis models have contributed to the basic understanding of joint disease and to the development of effective antiarthritic agents . Several models have been used to mimic human RA, ranging from immunization with cartilage components to infection with joint trophic organisms [20, 21]. Blocking TNF-α [6, 22] or IL-1 [23, 24] in these models has routinely shown benefit, although some questions remain regarding the role of these cytokines in mitigating joint inflammation versus preventing cartilage degradation and bone erosion . Using the Tg197 mice, we have shown that maintenance anti-TNF-α therapy, initiated after joint inflammation and erosions have occurred, allows damaged joints to heal. Specifically, anti-TNF-α mAb proved equally effective in reversing joint synovitis and erosions both in young mice, where an active repair process to damage occurs, and aged mice, where the repair process has relatively slowed. However, the repair of cartilage damage was different between young and aged mice. Cartilage in young mice treated with anti-TNF-α was significantly improved relative to saline-treated and baseline mice. By comparison, treatment of aged mice with anti-TNF-α prevented further cartilage damage but did not improve histological scores relative to baseline values. Mechanistically, the therapeutic effect of anti-TNF-α appears to be due to either neutralization of soluble hTNF-α or inhibition of hTNF-α production in the diseased joint. Additionally, other proinflammatory cytokine mRNAs were decreased in the local diseased tissues either through suppression of inflammatory cell infiltration or inhibition of cytokine production. 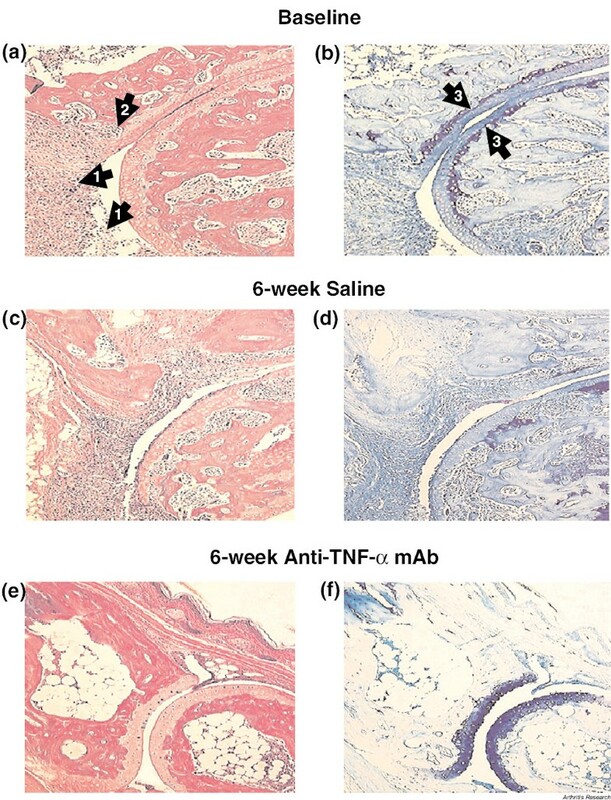 Moreover, anti-TNF-α treatment resulted in a modest inhibition of murine IL-1β production in the diseased joint, which is consistent with previous findings that anti-TNF-α antibody inhibits the generation of IL-1 in collagen-induced arthritis and IL-1, IL-6, and IL-8 in rheumatoid synovial cultures [26, 27]. Our study provides preclinical evidence supporting the use of anti-TNF-α mAb in ameliorating arthritic pathology. The progressive arthritis observed in Tg197 mice is similar to the pathology in patients with RA. Recent clinical data indicate that the blockade of TNF-α significantly reduces the signs and symptoms of RA [28, 29]and inhibits the progression of structural damage [30, 31]. It remains to be seen whether extended anti-TNF-α therapy might permit regeneration of articular cartilage and bone in established human disease, where multiple etiological pathways may contribute to the RA disease syndrome [32, 33]. Nevertheless, it is likely that much of the RA pathology involves TNF-α activation, and the results from the Tg197 model provide a sound scientific rationale for the therapeutic benefits observed following anti-TNF-α treatment in RA patients. Progression of established polyarthritis in the Tg197 hTNF-α transgenic mouse can be reversed by treatment with anti-TNF-α mAb, as shown by significant improvement in clinical and histological scores. Joint tissues from wrists, ankles, elbows, and knees were fixed in 10% buffered formalin overnight, decalcified in 10% formic acid for 18 days, dehydrated, and then embedded in paraffin. Specimens were cut longitudinally to the midline, and 5-m sections mounted for staining with hematoxylin and eosin or toluidine blue. Joint sections stained with hematoxylin and eosin were scored for synovitis and bone erosions, as described elsewhere [12, 13]. Sections stained with toluidine blue were scored for cartilage degradation (0, normal staining; 1, some loss of staining; 2, moderate loss of staining; 3, weak staining; 4, very weak staining; 5, no visible staining). Specimens were examined using light microscopy and scored in a blinded fashion with regard to treatment. Excised ankle and paw joints were immediately frozen in liquid nitrogen and processed in a freezer/mill (SPEX Certi-Prep, Metuchen, NJ, USA) with liquid nitrogen at 2-minute pulses. RNA was isolated from 50 mg of the joint powder with 1 ml Trizol reagent according to the manufacturer's instructions (Gibco BRL, Grand Island, NY, USA). RNA was extracted with 0.2 ml chloroform, precipitated with 0.5 ml isopropyl alcohol, and resuspended in 30 l diethyl pyrocarbonate-treated water. Ten micrograms of total RNA from each sample was used for RNase protection assay (mCK -2b and -3b Multi-Probe Template Sets, PharMingen, San Diego, CA, USA), exposed to a Phosphor screen, and quantified by a Phosphorimager with the use of Image Quant software (Molecular Dynamics, Sunnyvale, CA, USA). The signal-intensity ratio of different cytokine messenger RNA (mRNA) to GAPDH was determined. The authors thank Dr George Kollias for providing the Tg197 transgenic breeder mice and Dr Bernie Scallon for polymerase chain reaction analysis of the Tg197 mice.